Side dish: Roasted seaweed is good with beer according to Doo Soo. In case you don’t like beer, here are some other uses for roasted seaweed. Severe anthrophobe, Cha Hong Do (Choi Kang Hee) has travelled back to the Joseon era, where she is the new bride of her policeman crush, Jang Doo Soo (Lee Jae Yoon). He tells her he likes her red cheeks, then puts out the lights. The next morning, she asks him if he slept well, and he just holds her close. This is obviously a fantasy, but how did we get here? Let’s go back to the past to find out. 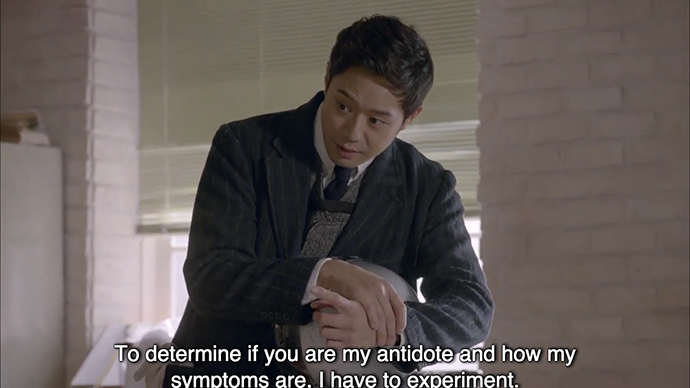 Obnoxious psychiatrist, Ko Yi Seok’s (Chun Jung Myung) lack of brain-to-mouth filter is in full evidence, as he marvels at the redness of Hong Do’s face in his sacked office. She begs him desperately to help her, and he flatly refuses, citing her accusation of murder as the reason. Instead, Yi Seok calls the police to report the break-in at his office. Doo Soo and his partner show up in response to Yi Seok’s call. Hong Do is still at the office, but she tries to hide when Doo Soo comes in. Yi Seok prevents her then demands that she tell him how many hearts he had displayed on his bookcase, since her memory is good. Yi Seok rudely instructs Doo Soo and his partner to call him if they find the missing hearts, and then leaves, dragging Hong Do with him. Outside the office, the two of them start bickering immediately. 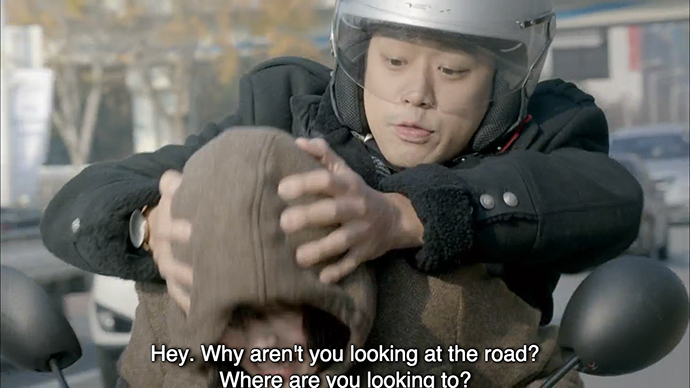 Yi Seok repeatedly tells Hong Do to get lost, then decides that he needs her to give him a ride to his car. 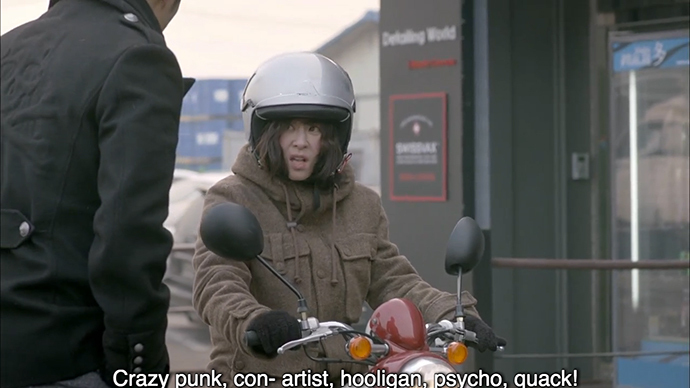 When they finally arrive at the car dealership, Yi Seok asks Hong Do why she needs treatment, when she’s solved her problem with the helmet. At her wit’s end, Hong Do blurts out that she just wanted to be able to talk to Doo Soo, and ask him if he slept well. Of course, this is the kind of question you ask someone you just slept with, and this is where our fantasy of earlier originated, as Hong Do imagines being able to do this with Doo Soo. In an expansive mood, Yi Seok agrees to treat Hong Do for his usual rate of $350/hour. Taken aback, she calls him every name under the sun then takes off on her scooter. While driving back, Yi Seok`s mentor, psychiatrist Uhm Gi Choon (Seo Yi Sook) calls to inform him that she has an office prepared for him at her clinic, but he rejects it. He turns his radio on instead, only to discover that his estranged girlfriend has a psychiatrist who helps out the elderly on her radio show. Annoyed, but inspired, he changes his mind, and decides to become a more empathetic person by helping out at Gi Choon’s clinic to get back in his girlfriend’s good books. But, when Yi Seok gets in the proximity of an elderly patient, he gets another attack of tinnitus and dizziness, to the point of passing out. On Gi Choon’s couch, Yi Seok explains that this had happened previously, but that it went away in the presence of Hong Do. Back at Yi Seok’s grandfather, the Chairman’s house, Butler An (Choi Moo Sung) is failing at taking dictation. Instead, they call in Oh Young Rae, the old woman persona that Hong Do uses to go to work. 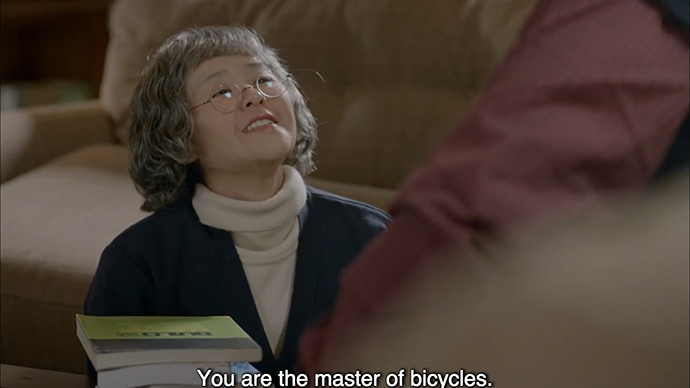 The Chairman tests Young Rae by giving her a list of books to find in his huge library, but she not only makes short work of his hard-to-decipher list, but also finds supplemental reading for him on the subject of bikes from the public library. The Chairman gets cranky regardless, but she soothes him with compliments on his muscles. Hong Do is not the only visitor at the Chairman’s house, as Gi Choon arrives to check in on Yi Seok’s mother, Moon Sun (Jin Hee Kyung). 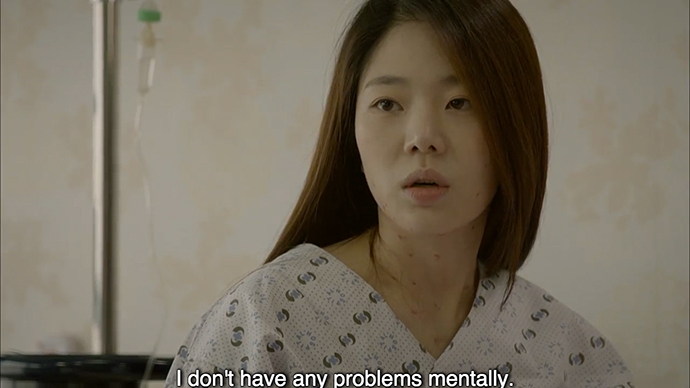 Moon Sun is in the depressive part of her bipolar cycle, and seemingly confused. 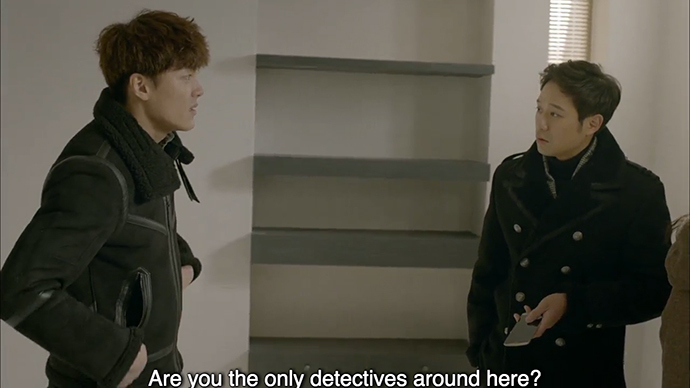 At the police station, Doo Soo and his partner are reviewing CCTV footage to find the robbery culprit when Yi Seok calls, and demands Hong Do’s phone number. When Doo Soo refuses, Yi Seok sends him the address of Gi Choon’s clinic to pass along to Hong Do for tomorrow, then hangs up on him. That night, Hong Do toasts seaweed for Doo Soo. When she goes to deliver it to him, Hong Do is caught outside by Doo Soo. He ends up taking her to his car so they can have a conversation without her getting nervous. Doo Soo tells Hong Do that he’d like to help her out, since she helps him so much. Unfortunately, Hong Do is so mesmerized by her proximity to him that she touches his hand with a finger. When they both realize what she’s doing, Hong Do freaks out and runs away. Back home, she touches her finger to her lips, Hong Do gets a message from Doo Soo, about Yi Seok’s request for her presence tomorrow. 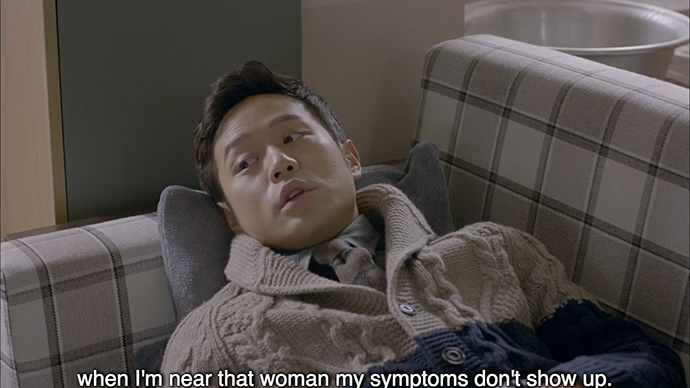 Yi Seok is hardly doing better, meeting with his estranged girlfriend in his car. He emphasizes that they are not yet broken up, and that he’s working on his problem. She looks less than impressed as he sends her off home. The next morning, Yi Seok has another tinnitus attack as the elderly patient from earlier comes to visit him, but it’s abruptly cut off by the arrival of Hong Do. Convinced that the magic cure is in her helmet, he drags it off her head. Back at the Chairman’s house, Yi Seok’s sister, Ko Se Ro (Ahn So Hee) is practicing for another role, when she gets a call from Doo Soo, who is sitting outside a convenience store. She mysteriously tells him that he should know what her letter is about, and hangs up. As Doo Soo protests to his partner, the naked woman goes streaking by again. At Yi Seok’s office, Hong Do refuses to go along with Yi Seok’s idea that she help him out with his patients unless he treats her for free in return. 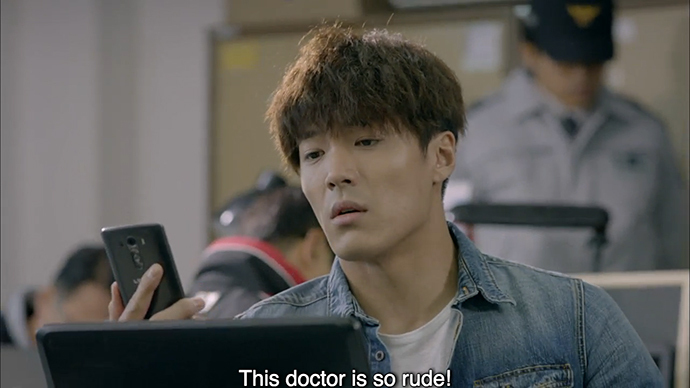 They’re interrupted by a phone call from Gi Choon, telling Yi Seok to go to the police station for a patient. Cornered, Yi Seok agrees to the exchange with Hong Do, and drags her along to the police station. There’s a melee at the police station, what with the naked woman, curious police officers, a skulking Hong Do, Doo Soo and his partner, and the unhelpful Yi Seok. Yi Seok’s usual treatment method of yelling aggressively yields no progress with the blank and trembling woman, until Hong Do offers her a candy. The naked woman finally comes to herself after eating it, but has no idea how she got there. Mystery solved: the naked woman is a diabetic who had gone into insulin shock from excessive dieting. They hand her over to the care of her mother, and that’s that. The next day, Hong Do shows up to the clinic, and Yi Seok immediately takes away her helmet and puts her to work cleaning the office. 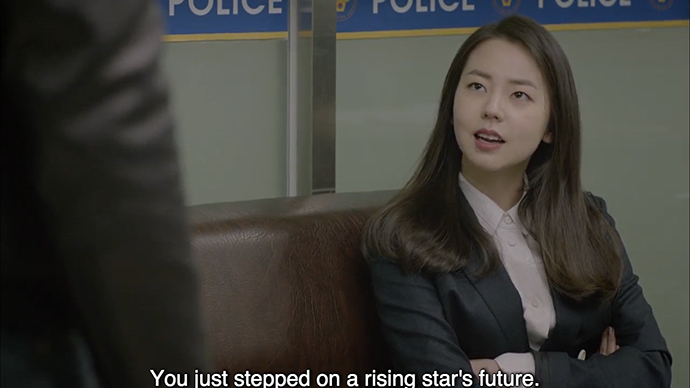 At the police station, Se Ro shows up to explain her lawsuit to Doo Soo. She wants compensation for her expenses in getting ready for the scene in the film that was cut due to the interruption from the naked woman and Doo Soo. Even though she generously left out the loss of her future career as a leading actress, Doo Soo is flabbergasted at the total of $2,730. With the office finally clean, Hong Do finally gets a consultation from Yi Seok. When he asks her to describe her discomfort, she tells him that she doesn’t like him looking at her, because he thinks she’s ugly. When Hong Do inevitably flips out at Yi Seok, calls him out on his self-obsessed behaviour and runs out the door, Yi Seok is forced to concede she may be right. The next day, Hong Do is cutting up fruit for Doo Soo when Yi Seok calls her to meet him at a hospital. When she goes to drop off the fruit, Doo Soo is getting ready to take a woman to meet family members. It sounds serious, and it must be, because Hong Do is completely disheartened when she goes to meet Yi Seok. It turns out that they’re at the hospital to treat the naked woman. Despite this, Hong Do is jealous of the patient for having ‘couple rings’ with her mother, indicating that they’re close. In the hospital room, the naked woman (now clothed) is covered in spots, and her mother is doing all the talking. With some nudging from Hong Do, Yi Seok asking about the couple rings. The naked woman finally confesses that she is sick of her mother pretending to care about her. Back at the office, Hong Do confesses that Yi Seok was pretty cool for getting to the root of the problem. Yi Seok is so happy to be praised that he decides to reward Hong Do by helping her ask Doo Soo if he slept well. The next morning, Hong Do hasn’t slept a wink when her alarm goes off. Yi Seok calls her shortly after for Doo Soo’s address, since he wants to be there to witness the big moment. By the time she gets to the apartment, she’s a nervous wreck, with Yi Seok shouting encouragement from behind her. Finally, Hong Do squares her shoulders, takes off her helmet, and gets ready as Doo Soo comes out. Hong Do can’t quite get the words out initially, but she gathers her courage, and blurts out that she likes him. The episode ends as her face turns beet red, and Yi Seok laughs, all unknowing, in the background. Firstly, you’ll have to pardon me if I’ve messed up terms on mental disorders; I’m reasonably ignorant on the subject, and happy to be corrected if someone knows better. Full confession here: if I had to put up with Yi Seok’s constant negative chatter, I probably would have punched him out by now. That said, I also have to confess that he’s such a weirdo that he’s growing on me as a character. So while I’m glad I don’t have to be stuck in a room with him, I am finding him oddly entertaining. The one thing I can’t understand is how, given his disastrous demeanour, he was ever a superstar psychiatrist. In all other respects, he’s remarkably consistent in his inconsistency: he’s a jackass to everyone except his mother; he hauls Hong Do around willy-nilly, but sits up like a puppy when she praises him; he’s cold to his girlfriend, but when she rejects him, he decides to become a better person for her; he comes off as insensitive, but can read Hong Do’s mood changes strangely well, given how little he sees her face. 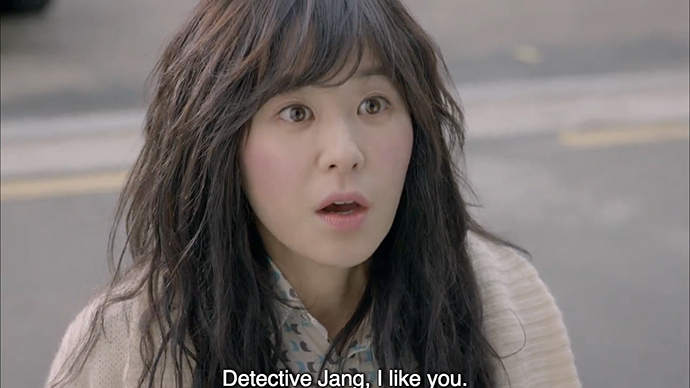 As for Hong Do, it was heartening to discover that there was a physical aspect to her unrequited love for Doo Soo. She’s not entertaining entirely innocent and girlish fantasies about him, but hoping to become his lover. Given that Hong Do has been portrayed as some kind of anxious helper mouse, having her express an entirely adult desire to touch Doo Soo was pretty cool. One thing I’m not getting across in these recaps is the slapstick dynamic between Hong Do and Yi Seok, and the little moments that keep the mood light. Suffice it to say, despite the heavy stuff this show is dealing with, the tone is surprisingly light. Given how iffy I was about this show last week, I’m enjoying it way more this week. The pace is good, the tone is light-hearted, but not inconsequential, and the characters are interesting (if not likeable). My hopes are up, show! Don’t let me down.